Acupuncture is usually done by inserting very thin needles at certain points on the body to restore the normal energy flow along the body's meridians. Dr. Rulli will discuss your condition and examine you to determine the appropriate points to needle. Needles are sterile, disposable and about the width of a course human hair. After the needles are inserted and stimulated, they remain in place for up to 20 minutes. Everyone has an individual response to acupuncture. Most patients report feeling a "heaviness, numbness, tingling or mild soreness after the needles have been inserted. "2 Acupuncture's effects are cumulative, building with each treatment. Usually 6 to 8 treatments will indicate if your condition will respond to acupuncture treatment. 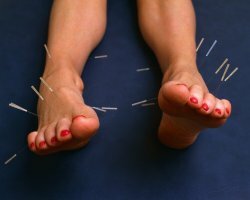 Dr. Rulli will discuss how many and how often you should be treated with acupuncture. Acupuncture is often used to successfully relieve chronic pain and treat many health conditions, from neck and back pain to boosting the immune system and anxiety disorders. Still have questions? Give us a call for more information.